Looking for a little humor for your Friday? Or maybe you want to learn a little something before the weekend and all that Superbowl party prep gets you going. This week, our communities serve up a smorgasbord for every taste. 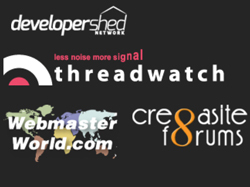 As usual, let’s start with Threadwatch. You’ll find our submitters boast a sharp sense of humor and will mix equal parts education and controversy as we talk about the topics of the day. If you love snark, check out joehall’s submission from Reddit of what a new Google Nigeria page might look like, with the phrase “please enter your bank account number” above the search box. Obviously, it’s not the real Google Nigeria page, but certainly earns a knowing smirk as we clean out all that spam from Nigerian princes trying to get help reclaiming their lost millions. Those in a sharing or learning frame of mind will enjoy the discussion AirDisa opened on SEO skills and what SEO, marketing, and social skills readers are glad they have. A great insight comes from Gyppo, who says “I often try to help clients make the most of what they already have first” in a number of ways, such as “Reworking poor performing content.” It’s great to see what you can do with what you have first. Slightly off-topic for SEO, but of interest to those of us who use MS Office and love our tablet computers, Brian Turner tells us that MS Office is only for Windows tablets. The software giant did not release a version for Apple’s iPad or Android devices. There’s a bit of controversy in the comments here, with some blasting Microsoft for not being customer-centric, and others saying that they’ve received great customer service from the software giant. Furthermore, Receptional “can’t understand why SEOs choose GoogleDocs over Excel…or Gmail over something they actually own for that matter.” Just how secure IS that cloud you’re using? Teasing out the effects of page rank for individual pages and how this affects a domain as a whole can be tricky – and not just grammatically. But SEO_AM lays it out carefully for the original poster: “Each page has its own ranking (Page Rank). Through interlinking of pages internal to the site to other site pages, you can affect the PR of other pages (passing the juice around). There is no such thing as site rank, but the linking structure/profile does affect the mystic authority and trust of the site in the eyes of Google.” Check out the rest of the thread for more advice on building a website’s link structure. You may have heard that having a video on your website can increase your site’s ranking in Google. But does it really? Once again, KernelPanic reveals the truth: “No, links increase your ranks. A compelling video of Kate Upton washing a car would probably attract links naturally and this would probably increase your ranks provided the links were relevant and passed authority.” In other words, it might work for your car wash website – but probably not if you’re selling real estate. What’s happening over on our Cre8asite Forums? Our members are looking for, and finding, more ways to reach their customers – and figuring out to which customers they should be aiming their time and resources. One of our administrators, iamlost, kicked off a great thread on why you should be targeting customers 50 and over. Then jonbey observed that “In 1993/4 at uni we covered this trend in demographics and discussed how the market will change in years to come. We are there now. But people don’t realise! Maybe we all want to be young at heart…” There’s also some disagreement as to whether young purchasers might be more valuable because they tend to be evangelists about what they buy. What do you think? If you’re curious about affiliate marketing, check out this busy thread on what affiliate marketing is and how you choose products. Experienced marketer EGOL (whom you’ll also find on SEO Chat) contributed the insight that “the best affiliate programs for me have been the ones that most closely match the reasons that bring people to my website.” There’s a treasure trove of information in this thread; it’s well worth mining. Finally, over on Webmaster World, they’re buzzing over new ads and ad possibilities – and laughing at what appears to be a pretty lame attempt to make money. One of our members spotted Google’s new animated AdSense ads and naturally posted about them. While a number of posters are impressed with what may be the biggest change to AdSense since it started, jadebox is wondering “Am I the only one who thinks that is really ugly and annoying? But, maybe that is what’s needed to encourage people to click.” Unusually for Webmaster World, you’ll find links to gifs of the ad in the thread, so you can observe the style and make up your own mind about it. A thread kicked off with Facebook’s quarterly and year-end financial results led to a major discussion of Facebook’s position in advertising when compared to Google. Some even question the relevance of the Internet itself. Check it out!